Proceeds from the silent auction will help fund the 90th Anniversary and Coffee Mess. ​Please see important FAQ at the bottom of this page about how to bid, payment requirements and how winners will receive items (yes, you can bid even if not at the event). 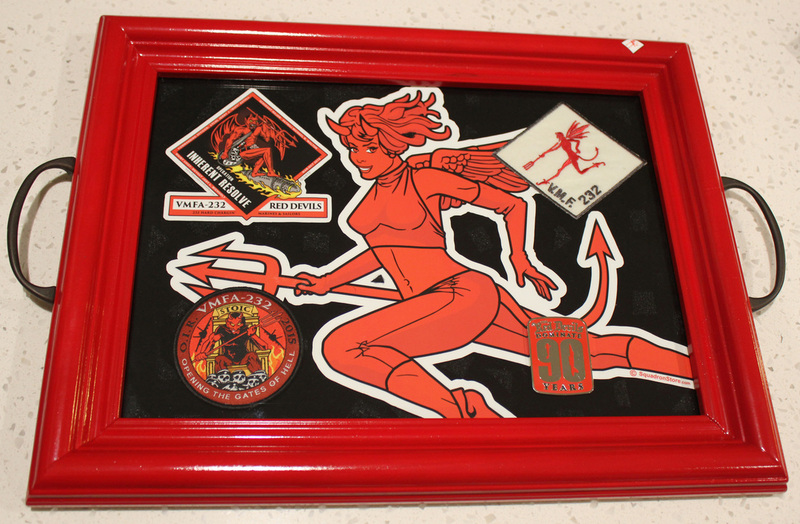 This framed display includes a replica of the earliest known representation of the Red Devil insignia, which can be viewed at the Flying Leatherneck Aviation Museum in San Diego, CA. Digital mockup - poster will be signed Wednesday night and framed afterwards. 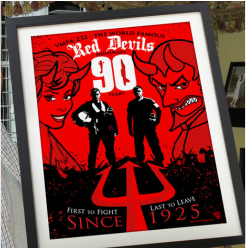 The same 18" x 14" print offered for sale, but this one is hand-signed by genuine Red Devils! ​Sorry, no photo available at this time! 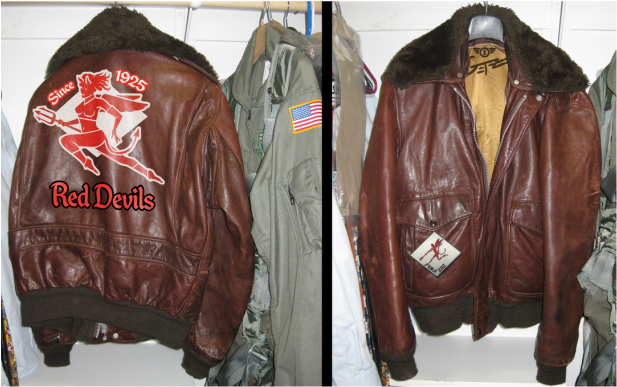 Accompanied by signed certificates of authenticity indicating they were flown on significant dates during the 90th year of the Red Devils. Sizing: there is no size information on the jacket, however the measurement between outer shoulders (outer edge of epaulets) is 20". Sleeve outside measurement (outer edge of epaulet to end of sleeve cuff) is 25.5". Distance of back from bottom of collar to bottom of jacket is 25"
* This item is marked as 'possible' because the painting isn't done yet. If unfinished - the jacket will not be sold at auction. ​Q: What is a 'silent auction'? A: For this application, it means there will be no 'caller' at the auction. Q: When is the silent auction? A: There will be an opportunity to preview the items for those attending the event Wednesday night. 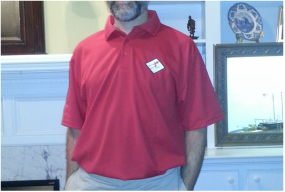 The actual auction will take place during the festivities Friday evening. Q: How will people at the event bid? A: Participants can view the items and place bids at their leisure during the event by clearly writing their names and bid amounts on the sheets provided at the auction tables. For attendees, this will not be a 'blind auction' - bids and names of bidders will be visible to attendees on the bidding sheets for each item. This will be a 'blind auction' for those making absentee bids as they will be unable to see other bid amounts. Q: How will people who are not at the event bid? A: In an effort to allow Red Devils and friends of the Red Devils who are not at the event to participate, we are allowing 'absentee' bidding. To bid if you ARE NOT attending the event, send an email to vmfa232reddevils@gmail.com with your top bid and full name, mailing address, phone number (ideally one we can reach you at the night of the event) and email address. If asked for credit card information, this will need to be provided quickly. Absentee bidders who do not provide credit card info by noon the day of the auction will not have their bids counted. If another absentee bidder has provided a bid higher than yours, you may not be asked for credit card info. Non-attendees have a disadvantage in that they will not know what others will be bidding at the event, so they are encouraged to list the highest amount they are willing to pay for an item (in other words, "Bid Big"). To avoid non-attendees finding their bids beaten too early, they will not be placed until 30 minutes before the end of the auction. If a bid is lower than the current top bid, the 'absentee bid' will not be placed at all. Q: Can I have my items shipped to me? Items will be insured for the final bid amount. If items arrive damaged from shipping, claims will need to be handled by the recipient. Q: To avoid shipping costs, can I give it to a friend who is attending the event? A: If a non-attendee has someone at the event they want the item given to, that person's full name and contact information should be mentioned in the email sent (see above). This can only happen with individuals attending the event. 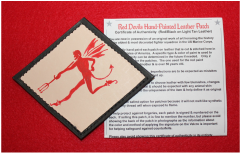 The Red Devils are free from all responsibility for an item once it is given to the designated individual. Q: What if I place a bid but forget to check back on it before the end of the auction and someone out-bids me? A: Paying attention is important if you want to win the item. We will call out reminders about the auction 1 hour, 30 minutes and 10 minutes before the auction end. Q: What if I think the opening bid is too high? A: The opening bid covers the cost to produce/frame the item, plus some profit for the squadron. The fate of items that receive no bids will be determined later. Q: Is there a required minimum 'percent' above the previous bid? A: No, other than that all bids must be in full dollar amounts. Bidders may bid one dollar above a previous bidder and win an item.